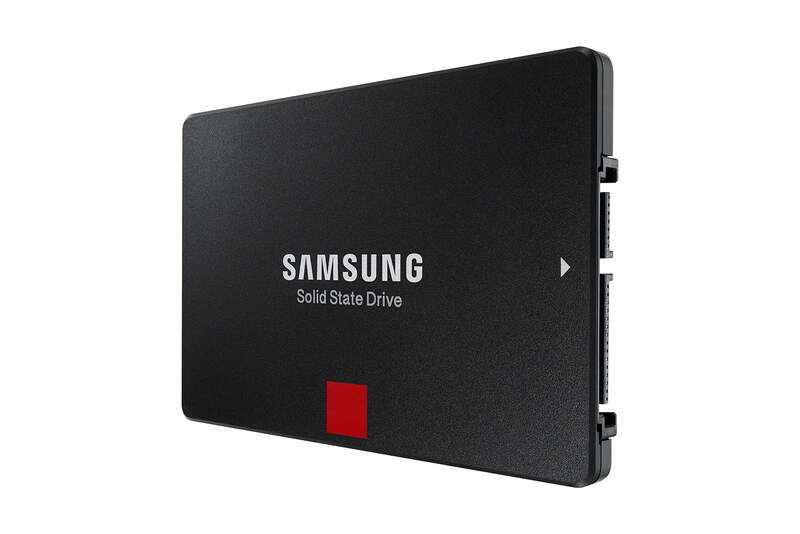 In a world headed toward NVMe, the appearance of a new 2.5-inch SATA SSD such as the Samsung 860 Pro might seem a bit boring. But that’s ignoring the fact that there are untold millions of PCs with legacy SATA interfaces that deserve the new lease on life that replacing their hard drive with an SSD delivers—it makes that drastic a difference in feel and actual performance. To that end, the 860 Pro is quite likely the best SATA SSD for the job. If the traditional concerns about capacity and longevity have held you back from upgrading to an SSD, then you’re going to love the 860 Pro. It offers a whopping 4TB of capacity using longer-lived 2-bit MLC V-NAND. As fast as any SATA SSD out there, and with a much higher longevity rating anything this side of X-Point memory, the 860 Pro is the optimal upgrade for your computer. The 860 Pro won’t be available in the M.2 form factor initially, though the cheaper 860 EVO, that was also announced today, will be. 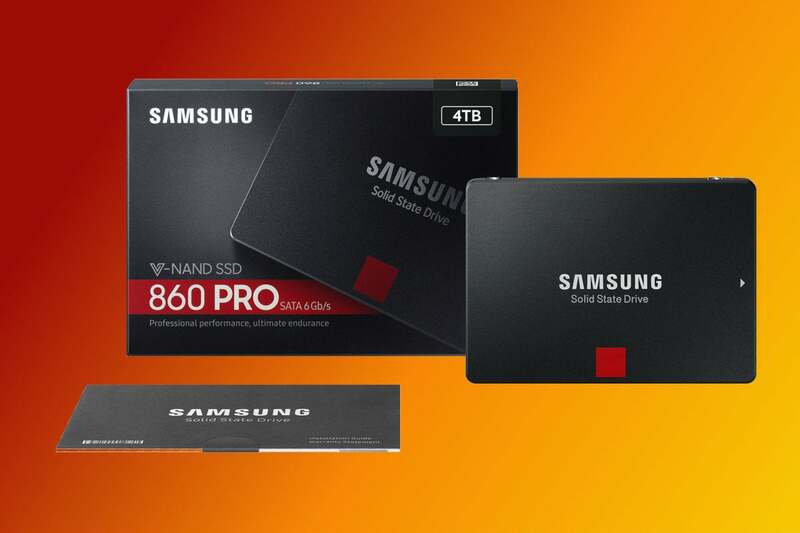 The 860 Pro is priced at $140 for 256GB, $250 for 512GB, $480 for 1TB, $950 for 2TB, and $1900 for 4TB. If you’re on a budget, said 860 EVO will cost $95 for 250GB, $170 for 512GB, $330 for 1TB, $650 for 2TB, and $1400 for the 4TB. If you just said “yikes!” to those 4TB prices (I did), then yes, hard drives are still a far better deal in terms of cost per TB. Currently, a 4TB hard drive is around $100. Ahem. So it still makes great sense to run your OS and vital applications, and perhaps your most frequently used data from an SSD, then keep the rest on an internal or USB hard drive. A big upside to 2-cell/2-bit/MLC NAND is that it lasts longer. The last I checked, most MLC was rated for around 5,000 writes per cell, while TLC such as that found in many drives these days was around a thousand. The 860 Pro series drives carry a TBW rating (TeraBytes Written-the total amount of data that may be written to the drive) that’s considerably higher than TLC-based drives: 1200TBW for each 1TB of capacity. The company says that this is because of improved NAND, and we’re figuring that 2-bits is the improvement. The 860 Pro turned in a very smooth and even performance in all our tests. But that’s commonplace, now that vendors have seemingly ironed out the issues with TLC and TLC controllers. Again, the 860 Pro is 2-bit MLC, so that’s a comment on the improved performance of the TLC competition. The 860 pro holds its own with other top drives. Higher numbers are better. 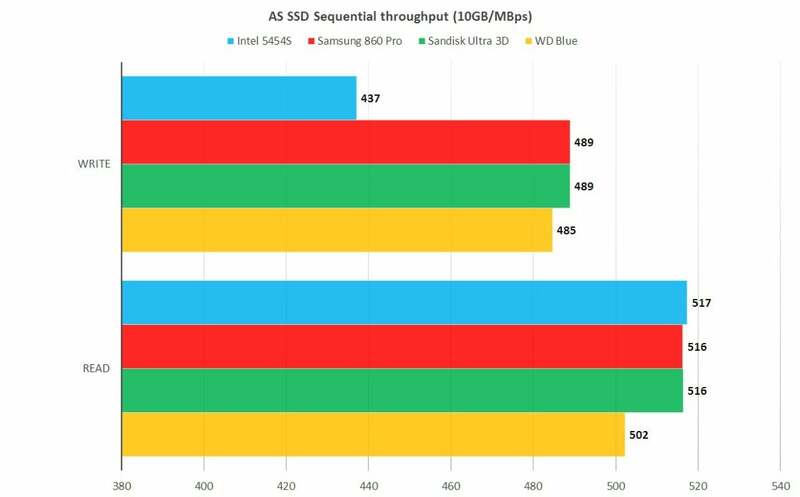 The 860 Pro is as fast as they come, according to the AS SSD benchmark which challenges the drives that obey the Forced Unit Access (FUA) command, which turns off both Windows and the drive’s caching. Why would anyone do such a thing? So there's a zero instead of 0.01 percent chance that data might get stuck in transit during an unexpected power-off. AS SSD's numbers don’t show real-world performance of drive that comply with FUA, but they can reveal the strengths and weaknesses of the underlying technology. These days, there’s not a lot to choose from with SATA drives when it comes to performance. Longer bars indicate better performance. 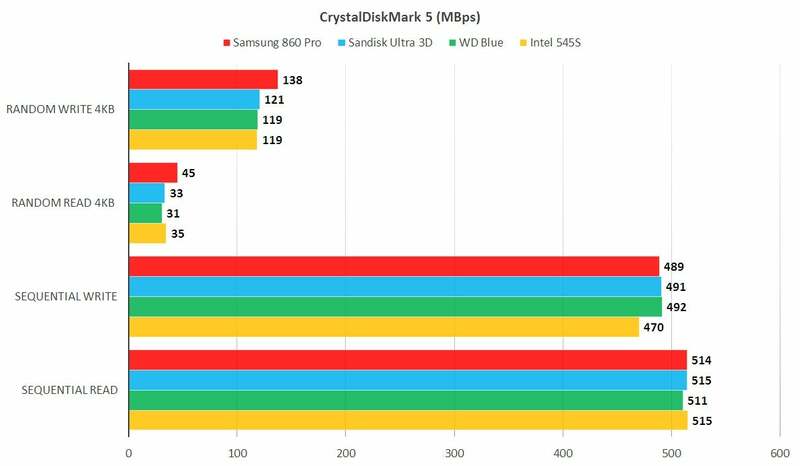 The Samsung 860 Pro also did very well in CrystalDiskMark 5, as shown above. CrystalDiskMark is generally a good indication of the read/write performance you’ll see in the real world, though it’s quite often overly optimistic about sustained write speeds. The Samsung 860 Pro bested all its rivals in our 20GB read and write tests. Lower numbers are better. The 860 Pro proved very fast and consistent in our 20GB copy tests. It took first place by a very narrow margin, but winning is winning, time is money, and fastest is fastest. How we test: As you can see above, we put every SSD through the popular AS SSD (1GB and 10GB) and CrystalDiskMark (32GB) tests. We also perform real-world copy tests to check the claims of the artificial benchmarks. We also spend a great deal of time observing the various drives in various settings to see how they hold up over the long-haul. 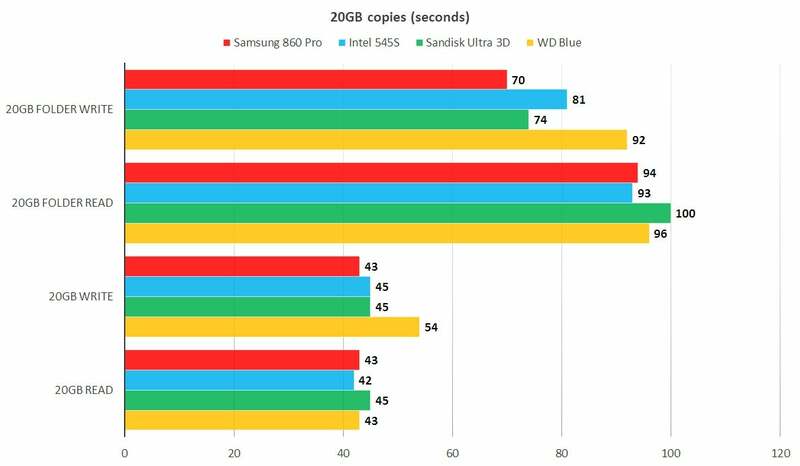 The Samsung 860 Pro is fast, and reasonably priced considering its best-in-class endurance rating (read about the NVMe Intel 900P to learn about some truly jaw-dropping endurance). You may find something a bit cheaper in a 2.5-inch SATA SSD—but you won’t anything better. Note: This article was edited on 1/24/2018 to correct a misstatement that the 850 Pro used 3-bit TLC NAND. It uses 2-bit MLC. PCWorld regrets the error. With top-notch performance and stellar longevity ratings, this drive is as good as it gets when it comes to 2.5-inch SATA SSDs. It's also available with up to 4TB of capacity, which should be enough for even the most demanding users. Pricey, but the best.